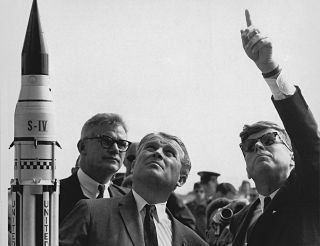 President Kennedy gets a lesson from Dr. von Braun in how the Saturn Launch System works. In this historical photo from the U.S. space agency, Dr. Wernher von Braun explains the Saturn Launch System to President John F. Kennedy. NASA Deputy Administrator Robert Seamans is to the left of von Braun on Nov. 16, 1963.